Understanding protein folding has long been a research focus for chemists. Molecular dynamics simulations can provide atomistic-level information on protein structure and dynamics. However, the systems under investigation are usually small and “clean” — with no disulfide bond or modification. In vivo, most proteins go through co-/post-translational modifications. One of the most common modifications is glycosylation. Glycans have crucial and diverse biological functions, modulating a wide variety of interactions. Besides these extrinsic effects, glycans can affect the intrinsic structure and stability of the glycoproteins. Glycosylation is often thought to induce or stabilize a beta-turn configuration on the attached proteins and we are working with a number of model peptides to characterize the origin and the strength of this induction and stabilization. From a protein engineering perspective, we are also very interested in the effects of non-natural amino acids on protein structure and folding. J. R. Rogers, S. M. McHugh, Y.-S. Lin, “Predictions for α-helical glycopeptide design from structural bioinformatics analysis,” J. Chem. Inf. Model. 57 2598‒2611 (2017). A. M. Phillips, L. O. Gonzalez, E. E. Nekongo, A. I. Ponomarenko, S. M. McHugh, V. Butty, S. S. Levine, Y.-S. Lin, L. A. Mirny, M. D. Shoulders, “Host proteostasis modulates influenza evolution,” eLife 6, e28652 (2017). M. D. Simon, Y. Maki, A. 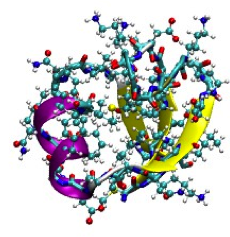 A. Vinogradov, C. Zhang, H. Yu, Y.-S. Lin, Y. Kajihara, B. L. Pentelute, “D-amino acid scan of two small proteins,” J. Am. Chem. Soc. 138, 12099‒12111 (2016).